© BMA Inc. 2008. All rights reserved. 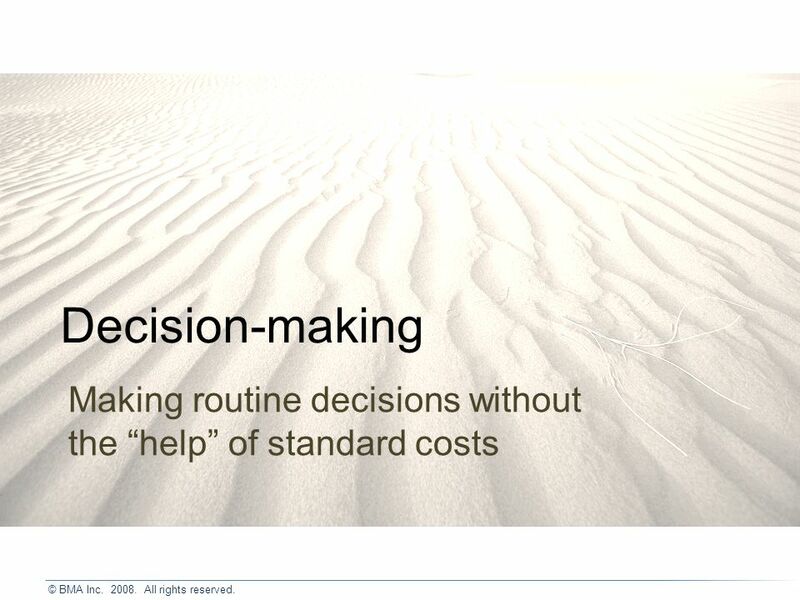 Decision-making Making routine decisions without the help of standard costs. 4 © BMA Inc. 2008. All rights reserved. Product Costing Drill on Drilling Machine Machine on Lathe Grind Inspect & Pack A. 6 minutes A. 4 minutesA. 8 minutes A. 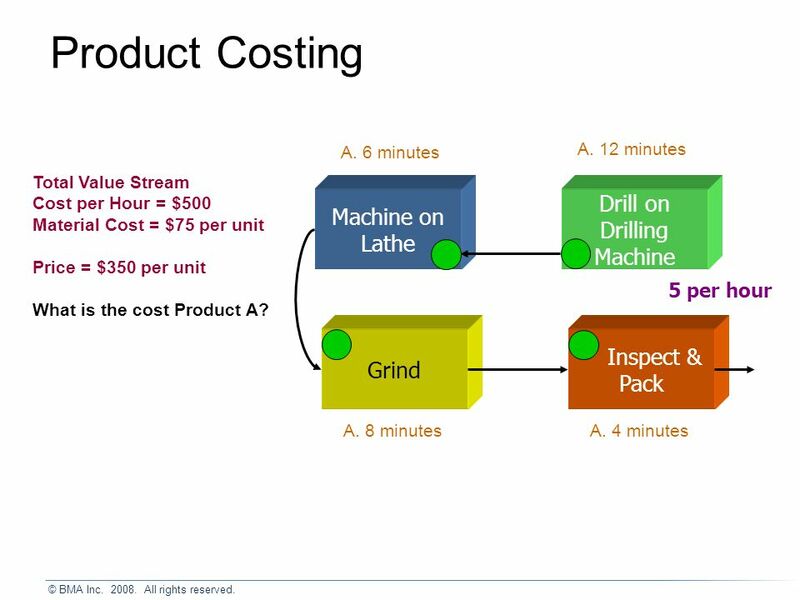 12 minutes 5 per hour Total Value Stream Cost per Hour = $500 Material Cost = $75 per unit Price = $350 per unit What is the cost Product A? 5 © BMA Inc. 2008. All rights reserved. A Second Product in the Value Stream Drill on Drilling Machine Machine on Lathe Grind Inspect & Pack B. 10 minutes A. 6 minutes A. 4 minutes B. 10 minutes A. 8 minutes B. 12 minutes A. 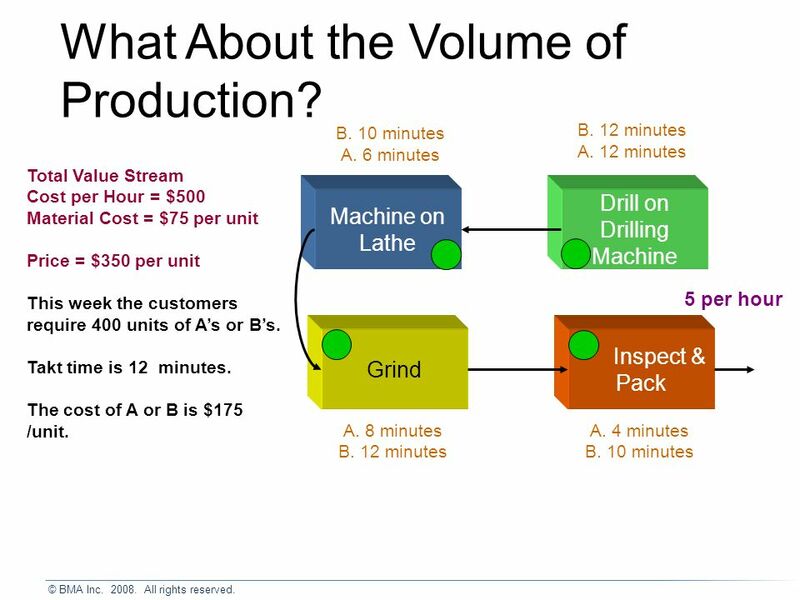 12 minutes 5 per hour Total Value Stream Cost per Hour = $500 Material Cost = $75 per unit Price = $350 per unit Product B is a lot more difficult to make and has a lot more labor & machine time. What is the cost of Product B? 6 © BMA Inc. 2008. All rights reserved. 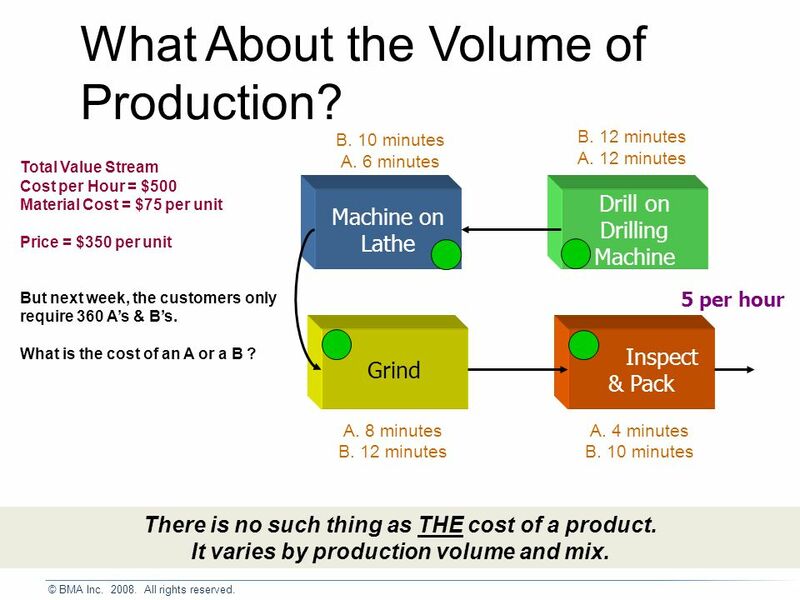 What About the Volume of Production? Drill on Drilling Machine Machine on Lathe Grind Inspect & Pack B. 10 minutes A. 6 minutes A. 4 minutes B. 10 minutes A. 8 minutes B. 12 minutes A. 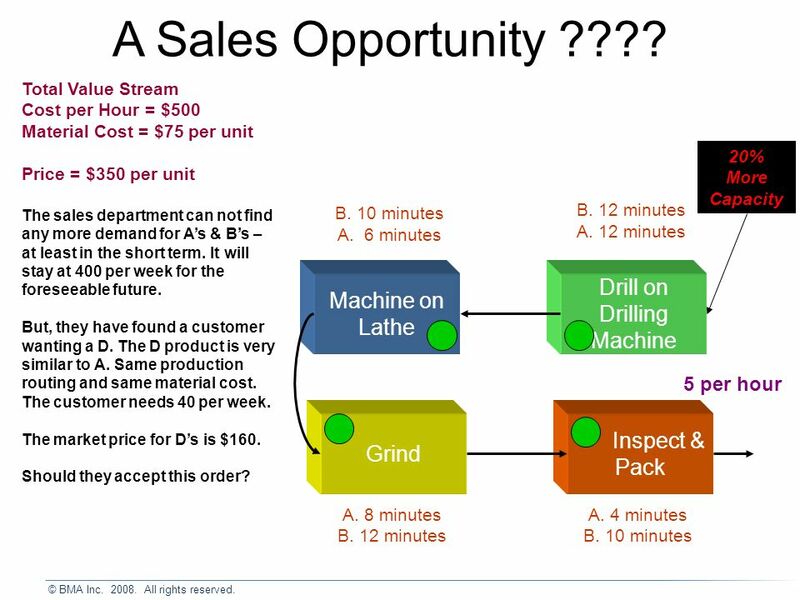 12 minutes 5 per hour Total Value Stream Cost per Hour = $500 Material Cost = $75 per unit Price = $350 per unit This week the customers require 400 units of As or Bs. Takt time is 12 minutes. The cost of A or B is $175 /unit. 7 © BMA Inc. 2008. All rights reserved. What About the Volume of Production? Drill on Drilling Machine Machine on Lathe Grind Inspect & Pack B. 10 minutes A. 6 minutes A. 4 minutes B. 10 minutes A. 8 minutes B. 12 minutes A. 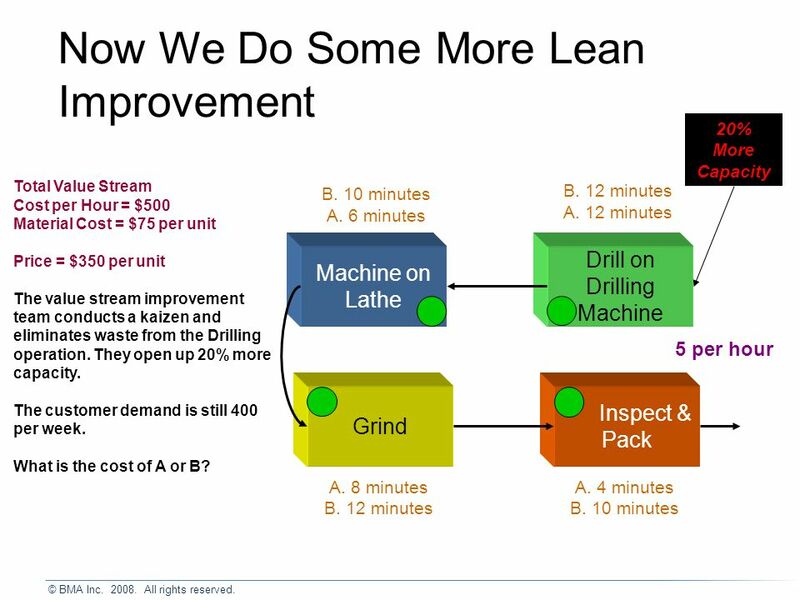 12 minutes 5 per hour Total Value Stream Cost per Hour = $500 Material Cost = $75 per unit Price = $350 per unit But next week, the customers only require 360 As & Bs. What is the cost of an A or a B ? There is no such thing as THE cost of a product. It varies by production volume and mix. 8 © BMA Inc. 2008. All rights reserved. A Third Product in the Value Stream Drill on Drilling Machine Machine on Lathe Grind Inspect & Pack C. 6 minutes B. 10 minutes A. 6 minutes A. 4 minutes B. 10 minutes C. 4 minutes A. 8 minutes B. 12 minutes C. 6 minutes C. Zero minutes B. 12 minutes A. 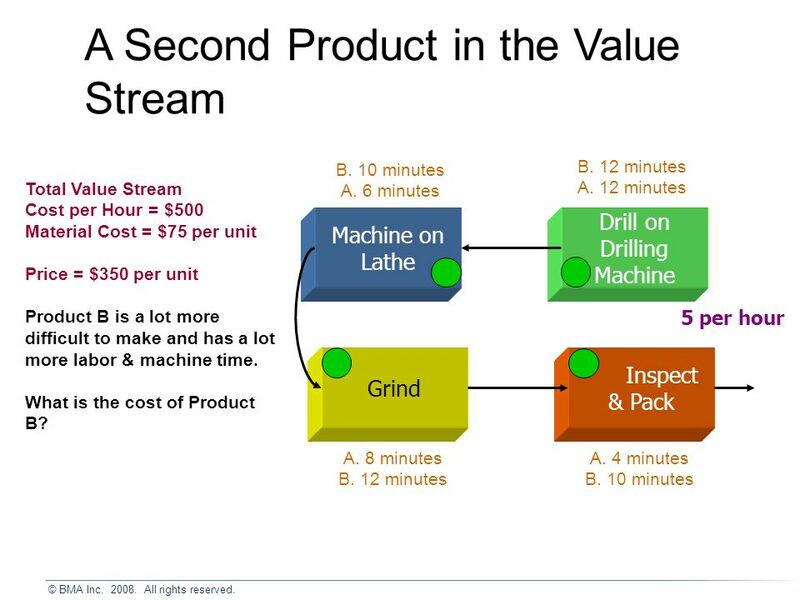 12 minutes 5 per hour Total Value Stream Cost per Hour = $500 Material Cost = $75 per unit Price = $350 per unit Product C does not use the Drilling Machine, but does go thru the lathe, the grinding machine, and inspect/pack. What is the cost of Product C (assuming there is capacity to make it)? 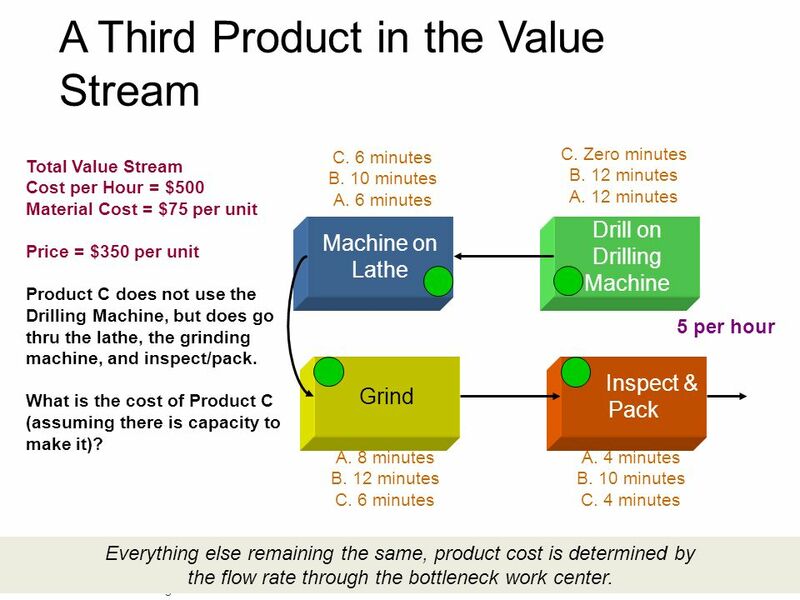 Everything else remaining the same, product cost is determined by the flow rate through the bottleneck work center. 11 © BMA Inc. 2008. All rights reserved. 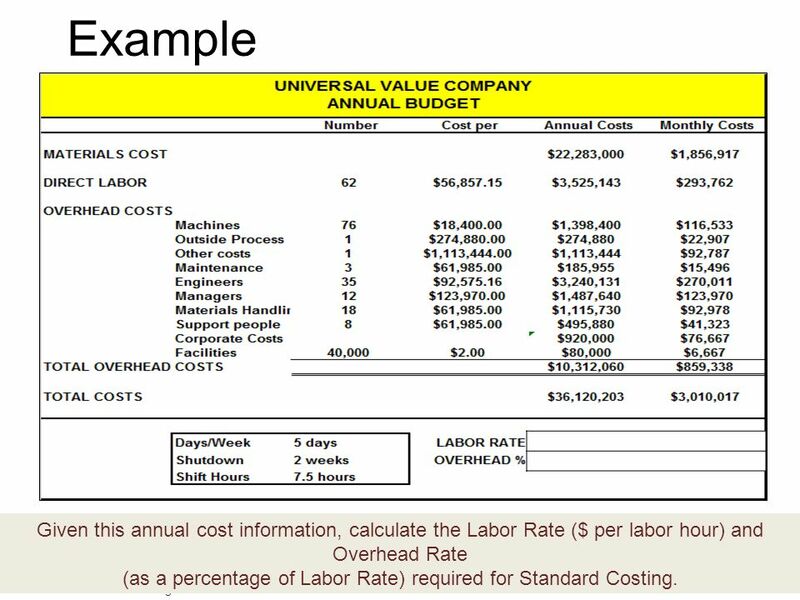 13 Example Given this annual cost information, calculate the Labor Rate ($ per labor hour) and Overhead Rate (as a percentage of Labor Rate) required for Standard Costing. 14 © BMA Inc. 2008. All rights reserved. 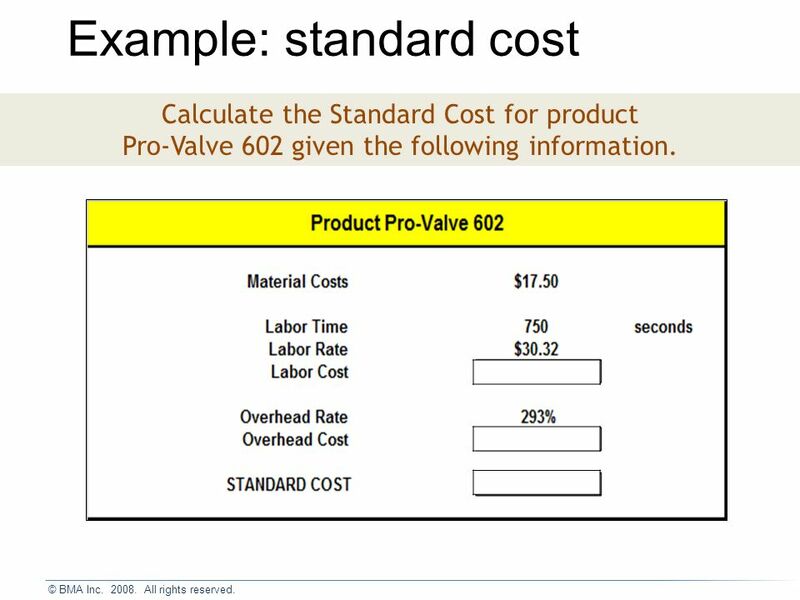 16 Example: standard cost Calculate the Standard Cost for product Pro-Valve 602 given the following information. 17 © BMA Inc. 2008. All rights reserved. 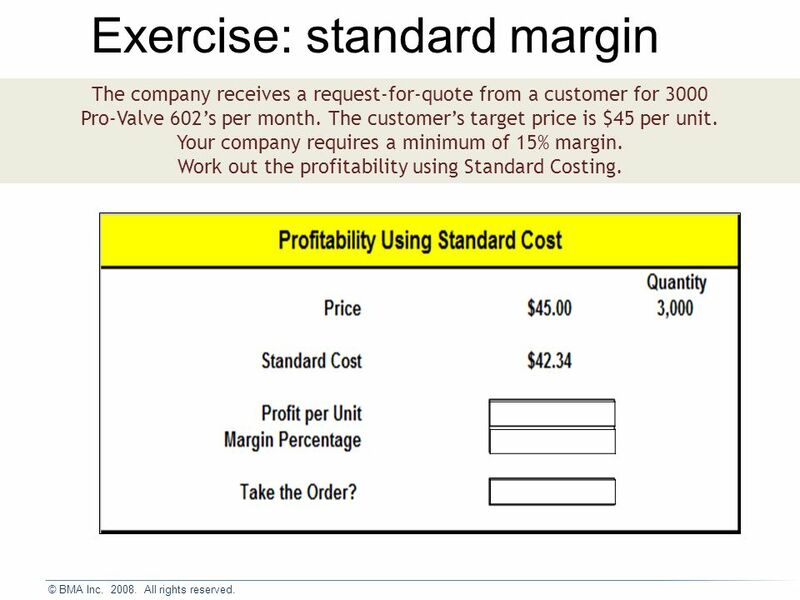 19 Exercise: standard margin The company receives a request-for-quote from a customer for 3000 Pro-Valve 602s per month. The customers target price is $45 per unit. Your company requires a minimum of 15% margin. 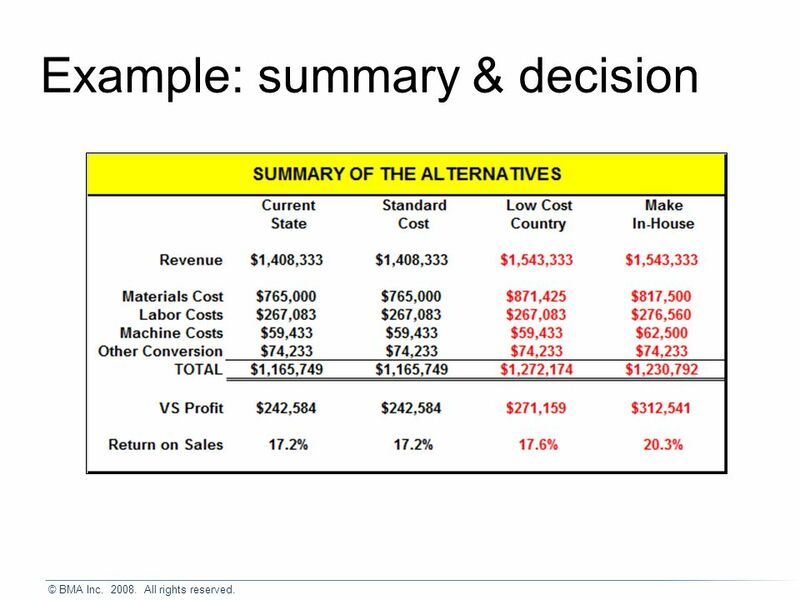 Work out the profitability using Standard Costing. 20 © BMA Inc. 2008. All rights reserved. 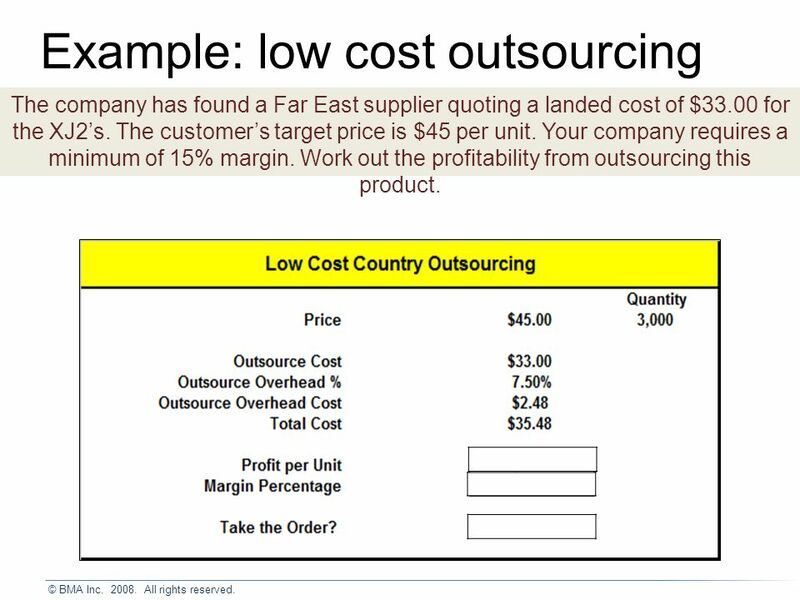 22 Example: low cost outsourcing The company has found a Far East supplier quoting a landed cost of $33.00 for the XJ2s. The customers target price is $45 per unit. Your company requires a minimum of 15% margin. Work out the profitability from outsourcing this product. 23 © BMA Inc. 2008. All rights reserved. 26 © BMA Inc. 2008. All rights reserved. 29 © BMA Inc. 2008. All rights reserved. 32 © BMA Inc. 2008. All rights reserved. 34 How do I set the price of a product? Pricing is set by the market. 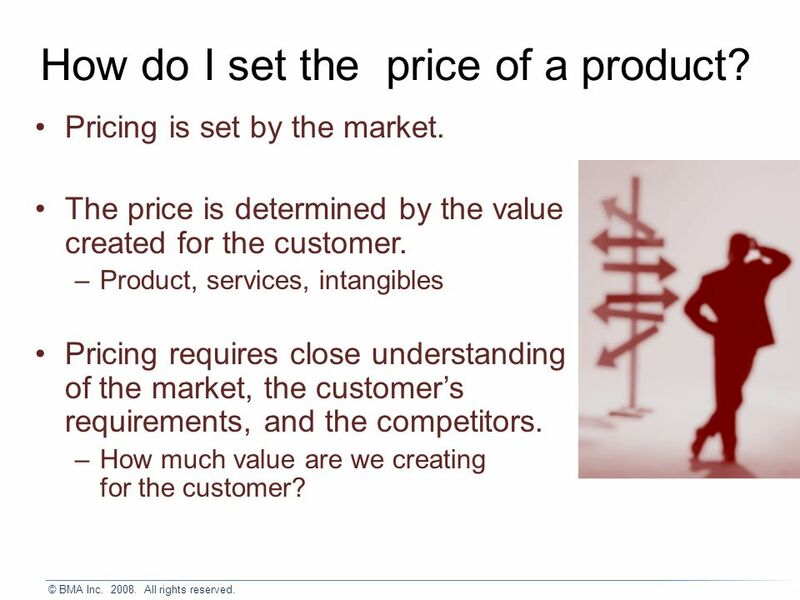 The price is determined by the value created for the customer. –Product, services, intangibles Pricing requires close understanding of the market, the customers requirements, and the competitors. –How much value are we creating for the customer? 35 © BMA Inc. 2008. All rights reserved. 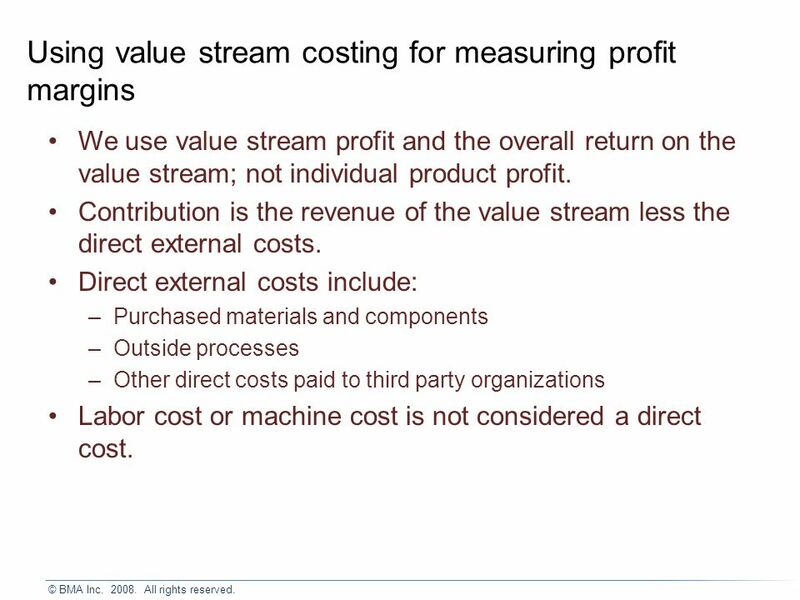 Using value stream costing for measuring profit margins We use value stream profit and the overall return on the value stream; not individual product profit. Contribution is the revenue of the value stream less the direct external costs. Direct external costs include: –Purchased materials and components –Outside processes –Other direct costs paid to third party organizations Labor cost or machine cost is not considered a direct cost. 36 © BMA Inc. 2008. All rights reserved. What about make/buy decisions? 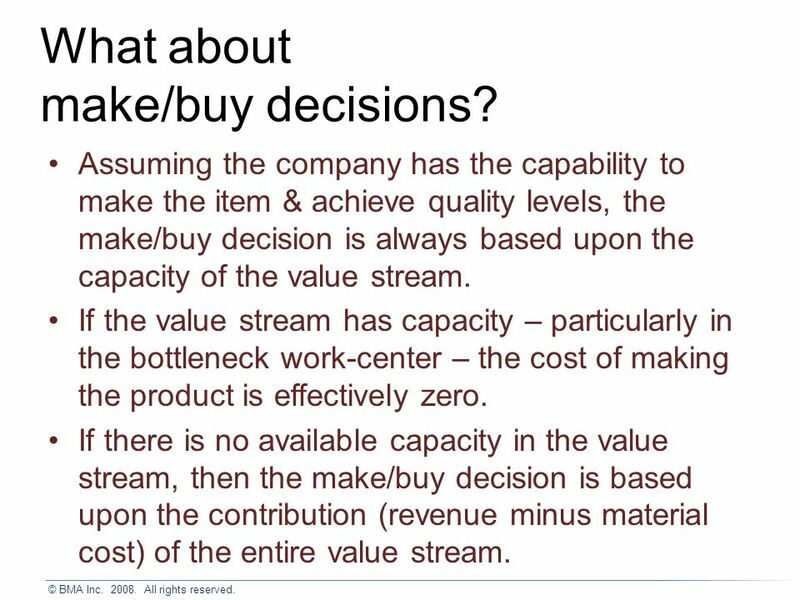 Assuming the company has the capability to make the item & achieve quality levels, the make/buy decision is always based upon the capacity of the value stream. 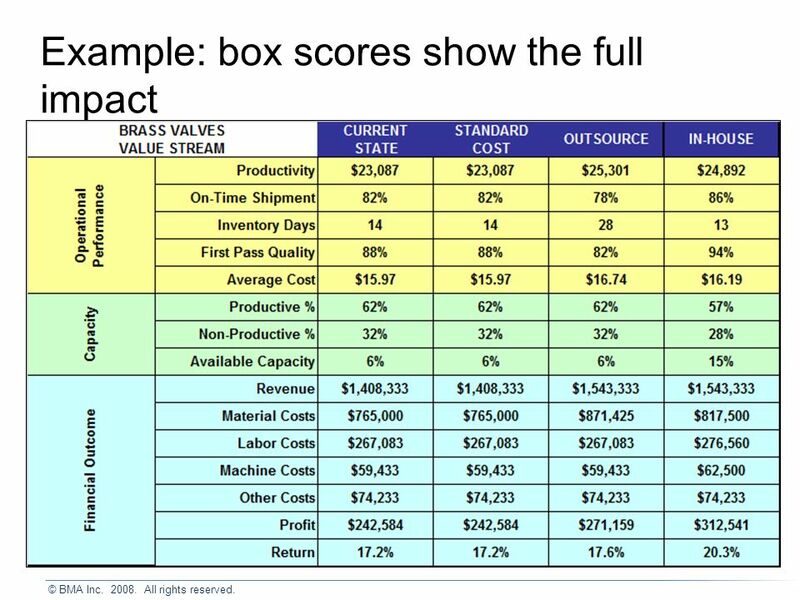 If the value stream has capacity – particularly in the bottleneck work-center – the cost of making the product is effectively zero. 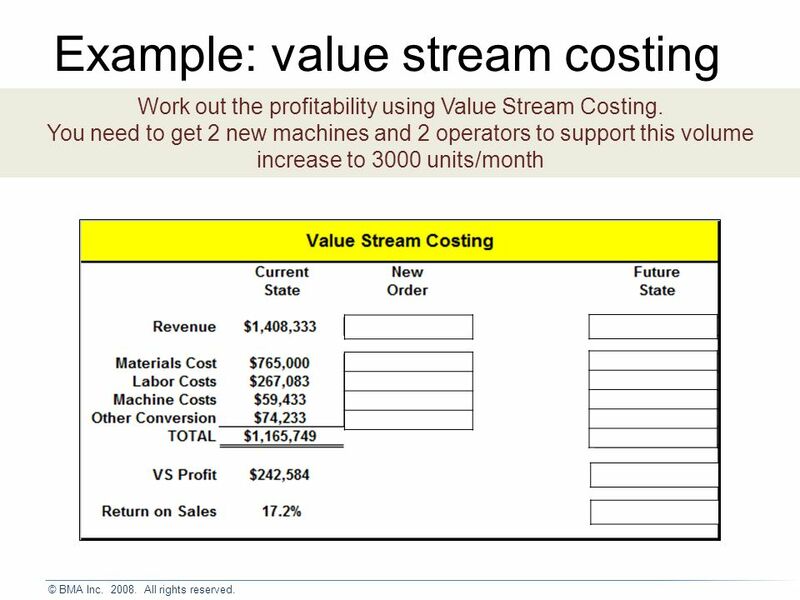 If there is no available capacity in the value stream, then the make/buy decision is based upon the contribution (revenue minus material cost) of the entire value stream. 37 © BMA Inc. 2008. All rights reserved. 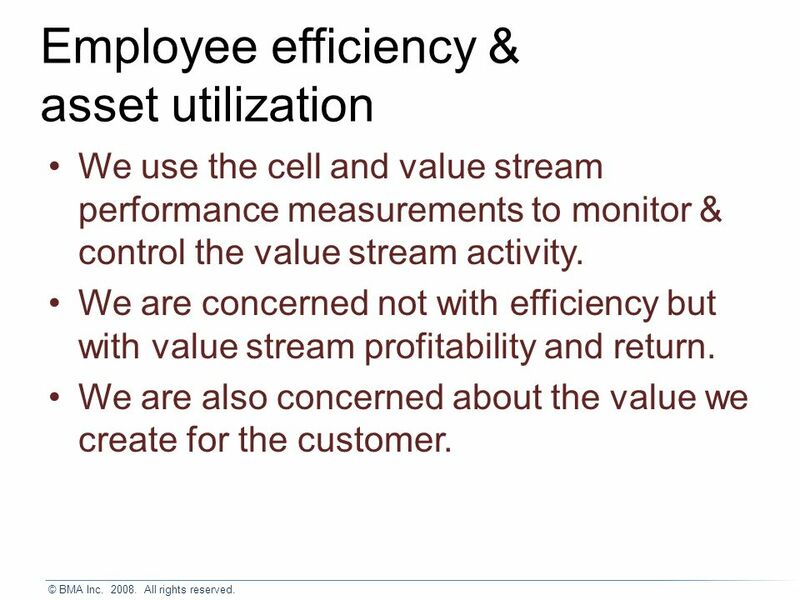 Employee efficiency & asset utilization We use the cell and value stream performance measurements to monitor & control the value stream activity. We are concerned not with efficiency but with value stream profitability and return. We are also concerned about the value we create for the customer. 38 © BMA Inc. 2008. All rights reserved. How should we approach new product introduction decisions? The same story…. 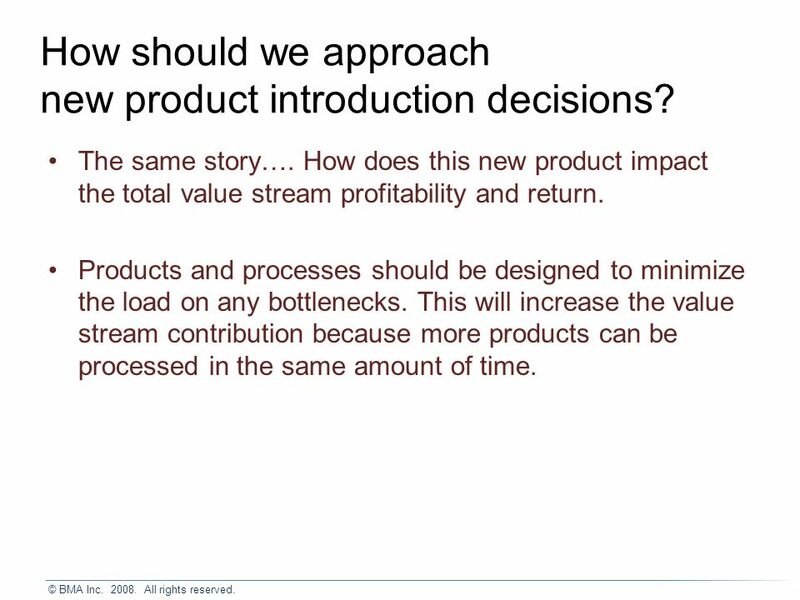 How does this new product impact the total value stream profitability and return. Products and processes should be designed to minimize the load on any bottlenecks. This will increase the value stream contribution because more products can be processed in the same amount of time. 39 © BMA Inc. 2008. All rights reserved. 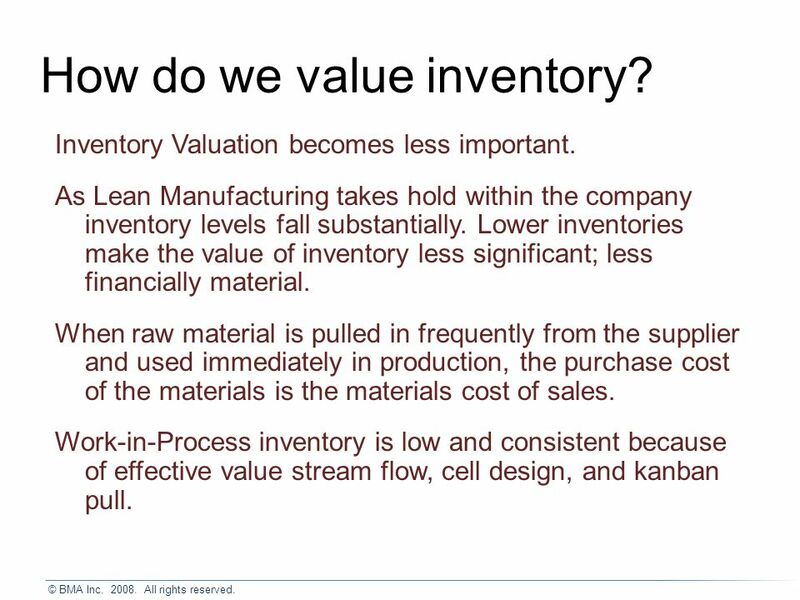 How do we value inventory? Inventory Valuation becomes less important. As Lean Manufacturing takes hold within the company inventory levels fall substantially. Lower inventories make the value of inventory less significant; less financially material. When raw material is pulled in frequently from the supplier and used immediately in production, the purchase cost of the materials is the materials cost of sales. Work-in-Process inventory is low and consistent because of effective value stream flow, cell design, and kanban pull. 40 © BMA Inc. 2008. All rights reserved. 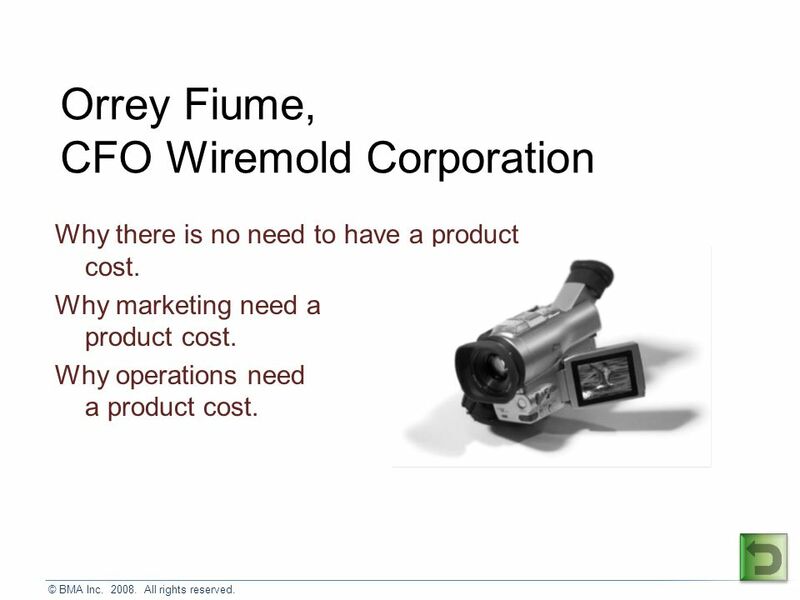 Orrey Fiume, CFO Wiremold Corporation Why there is no need to have a product cost. Why marketing need a product cost. 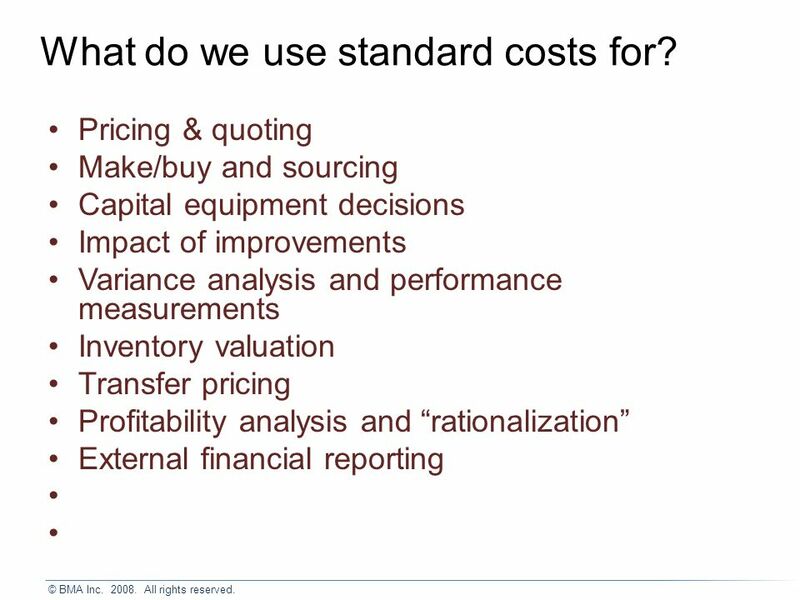 Why operations need a product cost. Download ppt "© BMA Inc. 2008. All rights reserved. Decision-making Making routine decisions without the help of standard costs." © BMA Inc All rights reserved. Lean decision making Box score. McGraw-Hill/Irwin Copyright © 2011 by The McGraw-Hill Companies, Inc. All rights reserved. Standard Costs: Direct Labor and Materials Chapter Twelve. 5.2 Costs and Revenues IBBM. Halil SATIK Industrial Engineering Department, Dokuz Eylul University, Turkey. © BMA Inc All rights reserved. 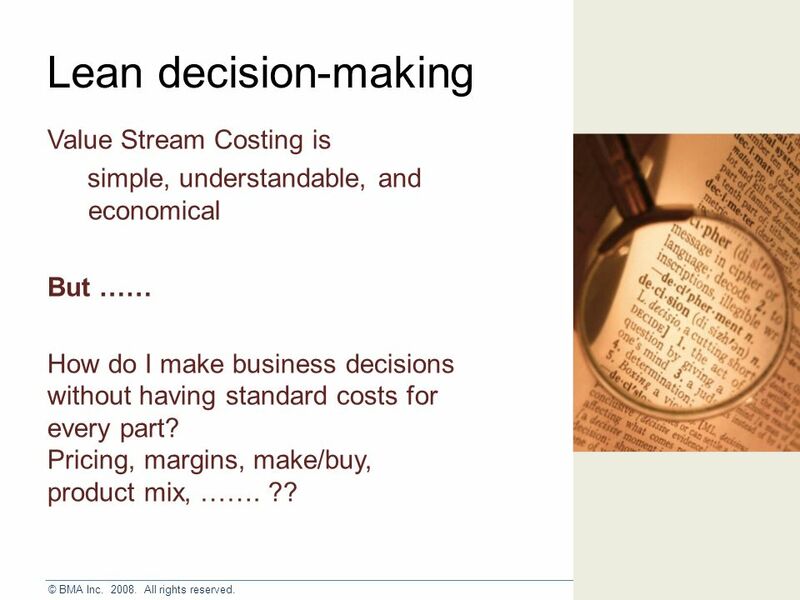 Value Stream Capacity Understanding Value Stream Decision Making. Inven - Cost - 1Inventory Basic Valuation Methods. Chapter 15 Short-term Planning Decisions. What are Relevant Costs & Revenues? s They are future costs & revenues. s They are included in making decisions. Chapter 4 How Businesses Work McGraw-Hill/Irwin Copyright © 2012 by The McGraw-Hill Companies, Inc. All rights reserved.